Simply courses all stem from our mission – “to make working for yourself work for you”. We have found that being good in seven fundamental areas provides the foundation for success in business. 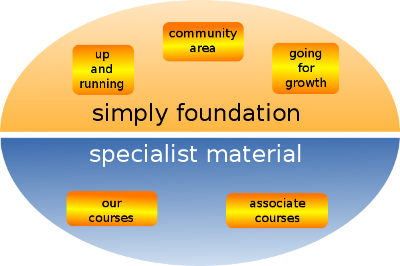 This foundation applies equally well from sole traders to large multi-nationals, whether you are aiming for profit, not-for-profit or a social enterprise / community group. The community area is where people from all areas converse, network, share information, consider news items etc. and it adds that personal touch to complement the core courses. Up and Running, which covers all the principles of business and has checklists and action plans for setting up all of the main things you are likely to need to do or set up. It is equally useful for startups and individuals or organisations and groups who are established, because the smart self checks highlight what you do well and what you need to do next. Going for growth, due out in early 2013, which will cover all of the key business areas but be more progressive, and it is for those who want more than just a average success from their business, charity or community group. The core courses will soon be complemented by specialist courses. Some are prepared by us, and some by associates of simply where we have confirmed that they build on the main foundation. See the specialist courses menu above to find out more. You have found the site for people who are passionate about working for themselves or running a social enterprise. more ...The public part of the website has news and useful articles, whilst the members' area has both practical, step-by-step courses and a supportive community area for sharing information and ideas. Start with the 'what we offer' in the menu above to discover how we fit into your plans for success.